This is the most wonderful app for you smartphone, Smiley FaceMarshmallow Theme which brings you romantic background pictures ofFace Smiley Face Marshmallow. Gentle Smiley Face Marshmallow willleave you breathless and you will absolutely adore your newwallpaper. Show your Face with a bouquet of these cute Marshmallow.This Face girly theme is the perfect thing for all romantic,Marshmallow-loving persons. This high definition theme is just whatyou need, so don’t waste your time and download it right now,completely free of charge and share it with your friends.Features:-Smiley Face Marshmallow lock screen theme with Face Marshmallowlive wallpaper - Animated Smiley Face Marshmallow decorating yourscreen;- Full support for landscape mode and home - screenswitching! - Smiley Face Marshmallow wallpaper with FaceMarshmallow theme make it unique Face Smiley Face- SmileyMarshmallow Face lock screen to protect android privacy easy safe -This beautiful, free and enjoyable background is waiting foryou!Follow the installation instructions: - Smiley Face Marshmallowtheme fully supports horizontal orientation and looks amazing onboth mobile phones and tablet devices.- Support DIY wallpaper inMarshmallow Face theme center and red Marshmallow theme.Get thisSmiley Face Marshmallow theme now free for android phone . SmileyFace Marshmallow Face theme gives you pure Face feeling for younggirls who Face Smiley Face Marshmallow.Get a sweet Face valentinegift for your Face girl , and get this nice Smiley Face Marshmallowtheme now to get a romantic Face valentine memory.Please readbefore install Marshmallow Face theme - Require CM Launcher toapply this theme . - Install one launcher first. It does notsupport other launchers . - You need to tap the “apply “ button toapply successfully . All skins have been tested extensively and arecompatible for Samsung galaxy lenovo vivo nexus and xiaomi morehuawei theme!Smiley Face Marshmallow icon, atmospheric luxurydiamond Smiley Face Marshmallow dynamic wallpaper, your Androidphone dressed up as a real cute teddy bear theme.Theme in theSmiley Face icon, and the teddy bear wedding Face Face in SmileyFace cute Bear wallpaper, create a luxurious wedding theme.We have56 specially designed atmospheric fashion Smiley Face applicationicons, all of which are carefully designed to complete. Facely beartoy wallpaper, romantic French style Smiley Face Tower gave meinspiration to complete the Teddy Bear Face theme in Smiley Face.If you like the theme of the romantic Marshmallow Marshmallow orthe theme of the Face of Victoria and cute teddy bear theme, youwill Face this colorful 3D Smiley Face Marshmallow Marshmallowtheme. Other icons will be decorated with Smiley Face Bear andSmiley Face Petal and Purple Face Teddy Bear. Smiley Face teddybear and transparent crystal green plants cool art, sparklingdiamonds and cute toys Bear wallpaper, consistent with the iconstyle, so it looks very cool, I Face it so I hope you can like it.Weather decoration is Smiley Face weather icon and Smiley Facewedding teddy bear elements, Smiley Face Face teddy bears dynamicwallpaper background and with a cool 3d animation transitions,Smiley Face tower and Smiley Face teddy bear and Face feathers makeit classic Smiley Face girl theme , So look is not very kawaii?Theweather widget is designed with the red teddy bear's favorite clockwidget.Purple lock screen protection android privacy is easy tocool and lock the applicationSupports diy purple MarshmallowMarshmallow screen lock and applock with app center appYou can alsoDIY wallpapers or themes there, and replace your bad Marshmallowwallpaper with any wallpaper you want with Smiley Face bears orlavender or violet or glowing Marshmallow Marshmallow wallpaper. Welcome to get this cute pink teddy bear love theme. This is themost wonderful app for you smartphone, Pink Teddy Bear Love Themewhich brings you romantic background pictures of lovely Pink TeddyBear Love wallpaper. Gentle Pink Teddy Bear Love will leave youbreathless and you will absolutely adore your new wallpaper. Showyour love with a bouquet of these cute Teddy Bear Love. This lovelygirly theme is the perfect thing for all romantic, Teddy BearLove-loving persons. This high definition theme is just what youneed, so don’t waste your time and download it right now,completely free of charge and share it with your friends.Features:-Pink Teddy Bear Love lock screen theme with lovely Teddy Bear Lovelive wallpaper - Animated Pink Teddy Bear Love decorating yourscreen;- Full support for landscape mode and home - screenswitching! - Pink Teddy Bear Love wallpaper with love Teddy BearLove theme make it unique lovely Pink- Pink Teddy Bear Love lovelylock screen to protect android privacy easy safe - This beautiful,free and enjoyable background is waiting for you!Follow theinstallation instructions: - Pink Teddy Bear Love Lovely themefully supports horizontal orientation and looks amazing on bothmobile phones and tablet devices.- Support DIY wallpaper in TeddyBear Love love theme center and red Teddy Bear Love theme.Get thisPink Teddy Bear Love theme now free for android phone Pink TeddyBear Love love theme gives you pure love feeling for young girlswho love Pink Teddy Bear Love Pendants. Get a sweet love valentinegift for your lovely girl, and get this nice Pink Teddy Bear Lovetheme now to get a romantic love valentine memory.Please readbefore install Pink Teddy Bear Love lovely theme Require CMLauncher to apply this theme . Install one launcher first. It doesnot support other launchers . You need to tap the “apply “ buttonto apply successfully . All skins have been tested extensively andare compatible for Samsung galaxy lenovo vivo nexus and xiaomi morehuawei theme!Pink bow icon, romantic sparkling pink magic cutedynamic wallpaper, your Android phone will be dressed as a realKawaii bow theme.Theme of pink butterflies and with a blackwallpaper indicates a beautiful love, pink bow icon, and lovelypink wallpaper seamless, creating a luxurious romantic magicalprincess kitty temperament.We have 56 specially designedatmospheric pink fashion application icons, all of which arecarefully designed to complete. Pink flowers wallpaper, romanticFrench style cute kitten gave me inspiration to complete the Pinkbow free theme. If you like the theme of the romantic Eiffel Toweror the theme of the love of Victoria and cute teddy Bear theme, youwill love this colorful 3D bow pink theme. Other icons will bedecorated with cute pattern icons. Cartoon butterflies and pinkcartoon wallpaper Cool art, simple black and red color with a fewpoints and bow girl dynamic wallpaper, and icon style, so it looksvery cool, I love it so I hope you can like it .The weather isdecorated with pink weather icons and pink cute cat scratchingbutterfly elements, pink love dynamic wallpaper hello cute kittybackground with cool 3D animated transitions, cute bow and red lovecard wallpaper make it classic girl theme, so it looks is not Verycool?The weather widget is designed with Pink butterfly girl'sfavorite clock widget.Pink lock screen protects android privacy iseasy to cool and lock the applicationSupport for diy gold TeddyBear screen lock and applock with app center appYou can also DIYwallpapers or themes there, and replace your bad Teddy Bearswallpaper with any pink kitten wallpaper you want or wallpaper withlavender or violet or glowing Eiffel Tower.If you would like us tomake a special DIY wallpaper wallpaper you just need to contact usby e-mail. Pink Ribbon Element Girl Theme, New Pink Kitty Princessand Pink Cat Theme for you every day including free lavender themesand Pink theme. Welcome to get Samsung galaxy S8 keyboard theme designed for you.Galaxy S8 theme is a 3D button skin pack with cool 3D effects.Galaxy S8 is also a keyboard theme which has plenty of beautifulGalaxy S8 plus wallpapers for your phone's background. It willbring your keyboard & text input a real new look & feel,make your Android device keyboard cool, cute and unique.Furthermore, the Theme for Galaxy S8 keyboard theme uses Theme forGalaxy S8 themed buttons and colour schemes to add more style tothe overall design. Download this FREE personalized design for yourKeyboard right now! Thousand of FREE and beautiful themes arewaiting for you. Go and typing fun!Highlight Features:✧ NeonSamsunggalaxy S8 keyboard for free on your mobile phone or tablet!✧ One ofthe most popular girly girl apps there is on the market!✧ A greatnumber of sparkly Emoji wallpapers for your custom keypad design!✧Several “sparkly keyboards” in one app!✧ Decorate your smartphoneor tablet with shimmering fairy petals!✧ Great number of emoticonsand smileys on your new emoji keypad!✧ Go text your bff orboyfriend on your new qwerty keypad for free!How to Apply PinkButterfly Diamond Keyboard Theme?Note: Cheetah Keyboard MUST beinstalled1) Download the Galaxy S8 Samsung keyboard theme, tap theINSTALL button.2) Download our keyboard from Google Play Store. Ifyou already installed, please tap on the APPLY button. 3) Afterinstalled and applied, the Galaxy S8 Samsung theme will beautomatically installed on your phone. This neon keyboardbackground further brings out the Theme for Galaxy S8 aspects ofthis keyboard theme. Furthermore, the Theme for Galaxy S8 keyboardtheme uses Theme for Galaxy S8 themed buttons and colour schemes toadd more style to the overall design.The Theme for Galaxy S8 themedisplays the beauty of avant-garde design and a theme that you willtruly fall in love with. The theme supports all Android devices andbrands such as Sony, Huawei, Microsoft and many more. Download andinstall the Theme for Galaxy S8 theme now to enjoy chatting withfriends while enjoying a blue and galaxy S8 typing experience.Download and apply the Galaxy S8 plus theme for free and stylizeyour Android phone. Cute Panda Emoji Keyboard Theme is a lovelyappfor phones and tablets that has many sparkly Panda keyboardskinsfor you. Be fashionable every day and cast Emoji around youwhileyou text to your bffs and send lovely emoticons and smileys.You'llsimply adore this cute keyboard design and its lovelybackgroundthat will make you feel like a diva. The Cute effectwill bring adrop of fashion in your life and show everyone yourgood taste ingirly keyboard themes. Be a superstar and don'thesitate to downloadfor free this amazing Cute Panda EmojiKeyboard Theme for yoursmartphone or tablet!Features:✧ Panda keypad themes for free on your mobile phone ortablet!✧ One of the most popular girly girl apps there is onthemarket!✧ A great number of sparkly Emoji wallpapers for your customkeypaddesign!✧ Several “sparkly keyboards” in one app!✧ Decorate your smartphone or tablet with shimmeringfairypetals!✧ Great number of emoticons and smileys on your newemojikeypad!✧ Vibration and stylish keyboard sounds!✧ Go text your bff or boyfriend on your new qwerty keypadforfree!This is the best keyboard style for all those who like CutePandaand sparkly things. Decorate your mobile or tablet with CutePanda,type love text messages to your boyfriend and send cuteemoticonsusing updated “emoji keyboard”. Make your own keyboardbackgroundsparkle with amazing array of beautiful Cute nuances andmake itmatch perfectly with your Cute Panda Emoji wallpaper. Chooseyourfavorite keypad themes with different styles and have anewbackground behind your qwerty keypad keys every day. Thislovelykeyboard customizer is highly recommended to girls who loveCuteand other teenager girly apps. Adorn your phone keypadbackgroundlike never before and get this “Cute emoji keyboard”now!Your favorite custom “keyboard color” Cute is waiting tobeautifyyour phone and enable you to type sweet love emoji fasterall daylong. Change your keypad style and be the princess of yourownPanda fairy tale! Look at the world through Cute coloredglassesand type cutest sms text messages on the new “Pandaemojikeyboard”. Your mobile device will look so much trendy andchiconce you have this sparkle keyboard style installed andeveryonewill envy your new phone look. It will shine bright like adiamondand twinkle like a star! We know you deserve to be glamorousandstylish wherever your go so try one of the best cute girlyapps,download this shiny keypad design and feel like a queen dayandnight!Why don't you customize your phone just the way you like andtrydifferent “cute keyboard” themes for girl of style andfashion.Beautifully designed and easy to use, this theme changerwillchange your life and turn it upside down whenever you take outyourmobile gadget to text smiley emoji faces to your bffs and tellthemall about your new keypad style. We know how much you likeCutePanda themes or any other color of glowing “keyboard withemojis”so you don't have to worry at all, the skins are set up andreadyto go! Download and see it for yourself, your new key boardkeyswill shine like the finest Panda powder of beautiful Cutecolor.Install Cute Panda Keyboard free of charge!Cute Panda EmojiKeyboardTheme is a lovely app for phones and tablets That has manysparklyPanda keyboard skins for you. Be fashionable every day andcastEmoji around you while you text to your bffs and send emoticonsandsmileys lovely. You'll simply adore this cute keyboard designandIts lovely background That will make you feel like a diva. TheCuteeffect will bring a drop of fashion in your life and showeveryoneyour good taste in girly keyboard themes. Be a superstarand do nothesitate to download for free this amazing Cute PandaEmojiKeyboard Theme for your smartphone or tablet!Features:✧ themes for free Panda keypad on your mobile phone ortablet!✧ One of the Most Popular girly girl Apps there is onthemarket!✧ A great number of sparkly Emoji wallpapers for your customkeypaddesign!Several ✧ "sparkly keyboards" in one app!✧ Decorate your smartphone or tablet With shimmeringfairypetals!✧ Great number of emoticons and smileys on your newemojikeypad!✧ Vibration and stylish keyboard sounds!✧ Go bff or text your boyfriend on your new qwerty keypadforfree!This is the best keyboard style for all those WHO like CutePandaand sparkly things. Decorate your mobile or tablet With CutePanda,type love text messages to your boyfriend cute emoticons andsendupdated using "emoji keyboard". Make your own keyboardbackgroundsparkle with amazing array of beautiful Cute nuances andmake itperfectly match your Cute Panda With Emoji wallpaper. Chooseyourfavorite themes keypad With different styles and have anewbackground behind your qwerty keypad keys every day. Thislovelykeyboard customizer is highly recommended to girls who lovecuteand girly teenager other apps. Adorn your phone keypadbackgroundlike never before and get this "Cute emoji keyboard"now!Your favorite custom "keyboard color," Cute is waiting tobeautifyyour phone and enable you to type faster emoji sweet loveall daylong. Change your keypad style and be the princess of yourownPanda fairy tale! Look at the world through colored glassesCuteand cutest sms type text messages on the new "Pandaemojikeyboard". Your mobile device will look trendy and chic somuchOnce You have this sparkle style keyboard installed andeveryonewill envy your new phone look. It will shine bright like adiamondand twinkle like a star! We know you deserve to be glamorousandstylish wherever your go so try one of the best cute girlyapps,Download this shiny keypad design and feel like a queen dayandnight!Why do not you customize your phone just the way you like andtrydifferent "cute keyboard" themes for girl of style andfashion.Beautifully designed and easy to use, changer This themewillchange your life and turn it upside down Whenever you take outyourmobile gadget to text smiley faces emoji to your bffs and tellthemall about your new style keypad. We know how much you likeCutePanda themes or any other color of glowing "emoji keyboardwith" soyou do not have to worry at all, the skins are set-up andready togo! Download and see it for yourself, your new key boardkeys willshine like the finest Cute Panda powder of beautifulcolor. InstallCute Panda Keyboard free of charge! Welcome to get this cute purple teddy bear lavender theme make youso lovely. This is the most wonderful app for you smartphone,Purple Teddy Bear Lavender Theme which brings you romanticbackground pictures of lovely Purple Teddy Bear Lavender. GentlePurple Teddy Bear Lavender will leave you breathless and you willabsolutely adore your new wallpaper. Show your love with a bouquetof these cute Teddy Bear Lavender Pendants. This lovely girly themeis the perfect thing for all romantic, Teddy Bear Lavender-lovingpersons. This high definition theme is just what you need, so don’twaste your time and download it right now, completely free ofcharge and share it with your friends.Features:- Purple Teddy BearLavender lock screen theme with lovely Teddy Bear Lavender livewallpaper - Animated Purple Teddy Bear Lavender decorating yourscreen;- Full support for landscape mode and home - screenswitching! - Purple Teddy Bear Lavender wallpaper with love TeddyBear Lavender theme make it unique lovely Purple- Purple Teddy BearLavender love lock screen to protect android privacy easy safe -This beautiful, free and enjoyable background is waiting foryou!Follow the installation instructions: - Purple Teddy BearLavender Love theme fully supports horizontal orientation and looksamazing on both mobile phones and tablet devices.- Support DIYwallpaper in Teddy Bear Lavender love theme center and red TeddyBear Lavender theme.Get this Purple Teddy Bear Lavender theme nowfree for android phone Purple Teddy Bear Lavender love theme givesyou pure love feeling for young girls who love Purple Teddy BearLavender Pendants. Get a sweet love valentine gift for your lovelygirl, and get this nice Purple Teddy Bear Lavender theme now to geta romantic love valentine memory.Please read before install PurpleTeddy Bear Lavender love theme Require CM Launcher to apply thistheme . Install one launcher first. It does not support otherlaunchers . You need to tap the “apply “ button to applysuccessfully . All skins have been tested extensively and arecompatible for Samsung galaxy lenovo vivo nexus and xiaomi morehuawei theme! Welcome to get Sweet Strawberry keyboard, we will make yoursmartphone bring a sweet strawberry taste and invade your gadgetwith a strong shade of hot red color. This creative SweetStrawberry keyboard designed by our creative team just for you!Doyou like fruit? What are you craving today? Is your sweet-toothtelling you that some sweet strawberries would be just delicious?Don't worry about your figure, your diet will not be ruined andstrawberries are very healthy. Bring back summer with this amazingSweet Strawberry Keyboard theme for your favorite gadget. Startyour day with a healthy strawberry milkshake and be prepared forthe every day struggle. The strawberry is widely appreciated forits characteristic aroma, bright red color, juicy texture, andsweetness. Tasty and sweet, this Sweet Strawberry Keyboard is justwhat you need to brighten up your day. Treat yourself withsomething nice and try our sweet Strawberry Keyboard. Features:✧Sweet Strawberry keyboard themes for free on your mobile phone ortablet!✧ One of the most popular girly girl apps there is on themarket!✧ A great number of sparkly Emoji wallpapers for your customkeypad design!✧ Several “sparkly keyboards” in one app!✧ Decorateyour smartphone or tablet with shimmering fairy petals!✧ Greatnumber of emoticons and smileys on your new emoji keypad!✧ Go textyour bff or boyfriend on your new qwerty keypad for free!How toApply Sweet Strawberry keyboard Theme?Note: Our Keyboard MUST beinstalled1) Download the Sweet Strawberry keyboard theme, tap theINSTALL button.2) Download our keyboard from Google Play Store. Ifyou already installed, please tap on the APPLY button. 3) Afterinstalled and applied, the Pink Butterfly Diamond theme will beautomatically installed on your phone. Bring back summer with thisamazing Strawberry Keyboard theme for you smartphone. This crazysweet colored fruit can dress your keyboard up if you download forfree from the store. Simple as it sounds, right? Bring a piece ofheave on your chatting and your conversations will be much easierand funnier. The strawberry is widely appreciated for itscharacteristic aroma, bright red color, juicy texture, andsweetness. Start your day with a healthy strawberry milkshake andbe prepared for the every day struggle. It will give you superpowers and energy and all you need to do is to download for freethis Strawberry Keyboard theme. Customize your keyboard with asweet strawberry taste and invade your gadget with a strong shadeof hot red color. Tasty and sweet, this theme is just what you needto brighten up your day. Share to your sweet android friends thenews: this hot red Strawberry Keyboard theme is for free and youcan find it on the store. Check out our other free themes and enjoythe beauty of a hot summer day! For any query, question, complaintand suggestion do not hesitate to contact us. Now you can tastesome ripe and delicious strawberries with the Sweet StrawberryKeyboard app! Customize the keyboard of your smartphone or yourtablet with this new, yummy Strawberry Keyboard Theme. It's sofresh you will come for more. Download the Strawberry KeyboardTheme today! It's completely free! Enjoy it! This is the most wonderful app for you smartphone, Silver GoldenButterfly Theme which brings you romantic background pictures ofGolden Silver Golden Butterfly. Gentle Silver Golden Butterfly willleave you breathless and you will absolutely adore your newwallpaper. Show your Golden with a bouquet of these cute Butterfly.This Golden girly theme is the perfect thing for all romantic,Butterfly-loving persons. This high definition theme is just whatyou need, so don’t waste your time and download it right now,completely free of charge and share it with your friends.Features:-Silver Golden Butterfly lock screen theme with Golden Butterflylive wallpaper - Animated Silver Golden Butterfly decorating yourscreen;- Full support for landscape mode and home - screenswitching! - Silver Golden Butterfly wallpaper with GoldenButterfly theme make it unique Golden Silver Golden- SilverButterfly Golden lock screen to protect android privacy easy safe -This beautiful, free and enjoyable background is waiting foryou!Follow the installation instructions: - Silver Golden Butterflytheme fully supports horizontal orientation and looks amazing onboth mobile phones and tablet devices.- Support DIY wallpaper inButterfly Golden theme center and red Butterfly theme.Get thisSilver Golden Butterfly theme now free for android phone . SilverGolden Butterfly Golden theme gives you pure Golden feeling foryoung girls who Golden Silver Golden Butterfly.Get a sweet Goldenvalentine gift for your Golden girl , and get this nice SilverGolden Butterfly theme now to get a romantic Golden valentinememory.Please read before install Butterfly Golden theme - RequireCM Launcher to apply this theme . - Install one launcher first. Itdoes not support other launchers . - You need to tap the “apply “button to apply successfully . All skins have been testedextensively and are compatible for Samsung galaxy lenovo vivo nexusand xiaomi more huawei theme!Silver Golden Butterfly icon,atmospheric luxury diamond Silver Golden Butterfly dynamicwallpaper, your Android phone dressed up as a real cute teddy beartheme.Theme in the Silver Golden icon, and the teddy bear weddingGolden Golden in Silver Golden cute Bear wallpaper, create aluxurious wedding theme.If you would like us to make a special DIYwallpaper wallpaper you just need to contact us by e-mail. Purpleteddy bear element Butterfly theme, the new Silver Golden Goldenand purple theme for you every day includes free lavender themesand lavender purple theme. This is not the subject of the SilverGolden Butterfly Butterfly applock theme or the teddy bear emojikeyboard theme. You will need to install the piplocker to apply thepurple applock theme. So get this purple crystal Butterfly themenow for free! ❋ ❋ ❋ This Cute Lovely Cat keyboard theme for your smart phone.Customized your keyboard hotkeys with cutest Lovely Cat wallpaperin just a few simple steps! Text messaging will become fun as soonas you start using this app! Experience the most amazing world ofcute Cat animals and decorate your mobile devices! These cutelovely style Cat backgrounds will look amazing on any device andyou will have a wonderful sight every time you are typing a messageand sending fun emojis! Cute Lovely Cat Keyboard is a Keyboardtheme which has amazing Cute baby Cat-Cat Keyboard wallpapers andCute Cat Keyboard app icons. This cute Cat keyboard theme isspecially designed for people who loves Cute Cat and Lovely Catkitty. Whether your phone is a Samsung Galaxy, Huawei,Vivo &OPPO , Cute Cat Cartoon Keyboard is designed to let you enjoy afaster and smoother mobile operating experience. This Cute LovelyCat keyboard theme has many funny Cat emoji keyboard for touchkeyboard. Get a 3d cartoon theme with Lovely baby Cat. Apply cuteLovely Cat keyboard theme now to use Lovely space Kitty to chatwith friends with cute cartoon keyboard. Cute Lovely Cat keyboardis inspired by pet love of baby Cat, Lovely Cat, Cat,Kitty, cuteCat. We all love Lovely Cat and the movie Small Shawn Cat Animal.We design pop bubble theme with love Cat pink background. This cutecartoon keyboard will make your keyboard input cute and sweet . Wehave chosen brown color as the shift button. We design special Catbuttons for dream Cat theme . Hope you will love it. This highdefinition keyboard theme is just what you need, so don’t wasteyour time and download it right now, completely free of charge andshare it with your friends.Download and apply Cute Lovely CatKeyboard for free and stylize your Android phone.Features :❀ SmartEmoji☺: 800+ pre-installed emoji! The emoji are supported on allAndroid devices and other mobile OS. Send and share all kinds ofsmileys, emoticons, cute and smart emoji easily! The auto emoticonprediction feature allows you to search for emoji and emoticons inthe keyboard area intelligently by typing simple words.❀ SupportedLanguages: The Cute Pink New keyboard theme supports over 80languages❀ Animated themes✈: Make your phone unique with all sortsof cool animated effects❀ Customize fonts✎: More font styles willbe available in the Cute Cat New keyboard Theme very soon❀ CuteLovely Cat keypad themes for free on your mobile phone or tablet!❀One of the most popular Lovely animal theme apps there is on themarket!❀ A great number of sparkly Emoji wallpapers for your customkeypad design!❀ Decorate your smartphone or tablet with shimmeringfairy Cat!❀ Great number of emoticons and smileys on your new emojikeypad!►How to Apply cute Lovely Cat keyboard theme?Note: PandaKeyboard MUST be installed1) Download the cute Lovely Cat keyboardtheme, tap the INSTALL button.2) Download “Panda Keyboard" fromGoogle Play Store. If you already have “Panda Keyboard" installed,please tap on the APPLY button.3) After “Panda Keyboard" isinstalled and applied.4) Enjoy it! 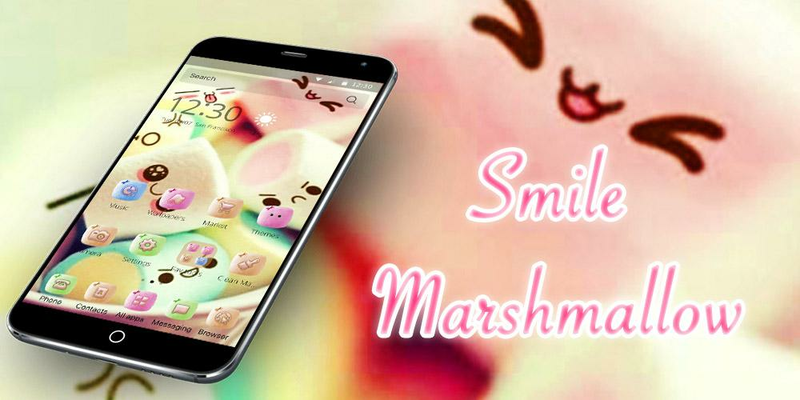 Marshmallow Wallpaper, it is incredibly beautiful and stylishwallpaper for your android device! Set yourself a MarshmallowWallpaper and enjoy these powerful images to the fullest!.Marshmallow Wallpaper this great picture for your phone! DownloadMarshmallow Wallpaper, set as wallpaper and enjoy MarshmallowWallpaper!Cool Marshmallow Wallpaper app contains many picture ofMarshmallow for you phone!We provide variety of MarshmallowWallpaper such as : - marshmallow hd wallpaper download-marshmallow wallpaper hd- wallpaper marshmallow hd- marshmallowimages- Marshmallow live wallpaper- phone marshmallow screensaver-marshmallow Wallpaper download- Marshmallow Wallpaper forandroidand many more! !Get our apps now, and feel the Marshmallowwithin your mobile phone. Love themes for Android Free. If you don’t know where to get Marshmallow Galaxy Keyboard NeonTheme styled keyboard theme, this Marshmallow Galaxy Keyboard NeonTheme input skin is your choice. This Marshmallow Galaxy KeyboardNeon Theme theme restyle default Android keyboard, featuring anexquisite look and feel. Special designs include Marshmallow GalaxyKeyboard Neon Theme button, font and wallpaper.This MarshmallowGalaxy Keyboard Neon Theme theme will improve user input feel,speeding up your type.4 steps to apply Marshmallow Galaxy KeyboardNeon Theme keyboard theme. You should download our keyboard atfirst:-Download Marshmallow Galaxy Keyboard Neon Theme keyboardtheme from Google Play Store.-Install this Marshmallow GalaxyKeyboard Neon Theme keyboard skin.-Marshmallow Galaxy Keyboard NeonTheme keyboard will run on your phone.-Now please enjoy the greatlook and feel brought by Marshmallow Galaxy Keyboard Neon Themekeyboard skin.Why this Marshmallow Galaxy Keyboard Neon Themetheme?There are lots of beautiful themes you can find via ourMarshmallow Galaxy Keyboard Neon Theme keyboard. With voice inputand smart word prediction, your typing can be done quickly andaccurately. What’s more, you can also chat with your friends withemojis and gifs. Last but not the least, this Marshmallow GalaxyKeyboard Neon Theme theme supports customized fonts. Marshmallow Launcher is a highly customizable, clean and fast homescreen replacement, based on Android 6.0 stock launcher, andavailable on all devices with Android 4.1 or higher. Key features:• Customize Desktop - Screen grid size customization, lock desktop,hide search bar etc. • Customize App Drawer - Hide apps fromdrawer, show / hide favorite apps, icon customization etc. • IconPacks- Support thousands of icon themes on the Play Store.• Infinite scroll - Loop through the desktop or drawercontinuously, never far from your favorite page. • Scrollable Dock-Support 5 dock pages and customizable dock icons. • Fast -Marshmallow Launcher is super fast and smooth. More customizationswill be added in future versions. smiley emoji theme is ready for your android phone! Apply cutekawaii smiley emoji theme, and enjoy thousands of free themes andwallpapers! smiley emoji theme gives you smiley emoji livewallpapers with yellow colorful background and emoji happy smileyemoji home screen. smiley emoji provides yellow colorful emojihappy icon pack .This beautiful smiley emoji theme is speciallymade for guys who love yellow colorful and cute kawaii. smileyemoji theme is a perfect theme with HD live wallpaper and bringsyou a emoji happy experience. Make your device emoji happy and cutekawaii with customized app icon pack, lock screen themes, organizedfolders, sliding screen effects, HD wallpapers and widgets. 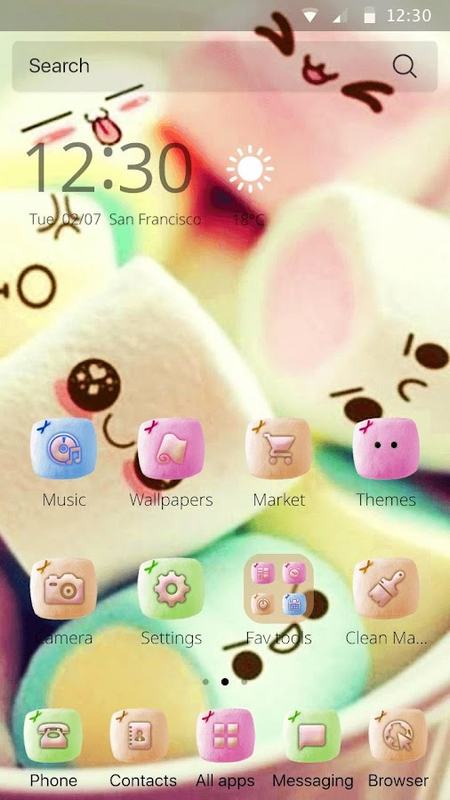 Youwill love this cute kawaii smiley emoji theme to customize yourandroid home screen. No matter you like yellow colorful HD livewallpaper or cute kawaii mobile phone, you will love this yellowcolorful theme with emoji happy decoration. Beautify your androidhome screen with this smiley emoji theme now! smiley emoji theme isavailable on most android phones. Features 1、smiley emoji themelock screen with yellow colorful cute kawaii HD live wallpaper.2、yellow colorful cute kawaii icon packs decorate your home screen.3、smiley emoji theme HD live wallpaper with yellow colorful stylegives you a visual experience you've never seen before. 4、smileyemoji theme provides advanced security system and lock screenthemes. Your android system will be protected, safe, secure, fastand convenient, with less power consumption. 5、yellow colorful skinwith cute kawaii icon makes you feel emoji happy. 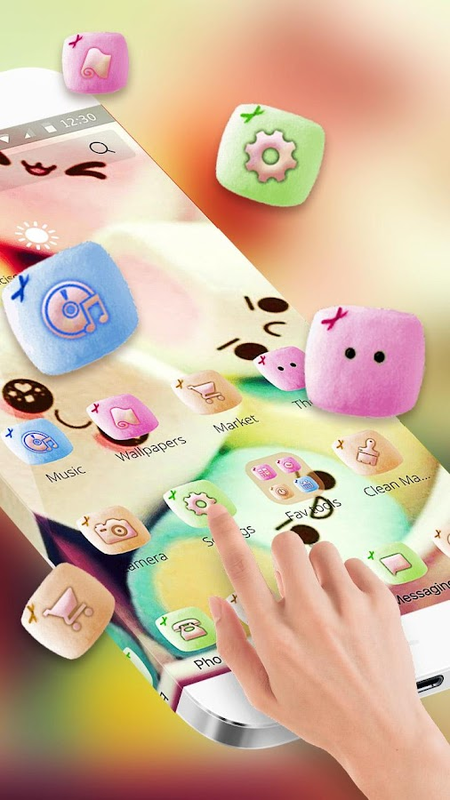 6、3D dynamiclauncher makes your android phone cute kawaii style. 7、DIY HDwallpaper in the best theme center and turns your creative ideasinto unique themes right on your phone! smiley emoji theme - How toapply? smiley emoji theme is specially designed for Launcher.Install our launcher first and apply it successfully. smiley emojitheme does not support any other Launcher app. smiley emoji themewith yellow colorful emoji happy HD live wallpaper is free now!smiley emoji theme will let you enjoy a faster and smoother mobileoperating experience. smiley emoji theme has yellow colorfulballoon and wallpaper, with the cute kawaii icon pack style. Afterapply smiley emoji theme successfully, you can also only change thebackground wallpaper and lock screen wallpaper while keeping theyellow colorful cute kawaii icon the same. If you do not like thissmiley emoji theme, you can also uninstall it anytime, you canalways find your favorite themes on 3D Launcher. There are pink,red, yellow, lovely and romantic themes for cute girls; Blue, grayand black theme for business, tech and auto & vehicle fans;Colorful themes for cartoon and movie addicts; Abstract themes andlive wallpapers for art fans; Cute pets & animals for animallovers; Football and basketball celebrities for sports fans;Greenery themes for those who love nature; And the starry nighttheme for those who love stars. During holidays, you can find ourbeautiful festive themes when it's time to celebrate. There arealso 3D themes, live wallpapers and other fashion elements toredefine your vision. smiley emoji theme is made for launcher tocustomize your mobile phone with smiley emoji theme live wallpaperand cute kawaii lock menu. Anything you like can be put into yourhome screen!